This baby card is headed overseas to welcome a sweet baby girl born this week! Her grandma is one of my best friends and I visited her dad the day after he was born! That's how it goes these days - my baby cards are sent to the babies of my friends' babies! If you are close to my age you understood that sentence perfectly! The sketch at Pals Paper Arts worked perfectly to focus on the sentiment - which happens to be the challenge at the Paper Players this week! The sentiment is from Celebrate Baby and Hello Honey was swiped and wiped from that marvelous new DSP called Irresistibly Yours to highlight the stars. Just LOVE this Linda! Great colors and withe the swirls and swoosh of color, there is so much movement! Love your artistic interpretation of the sketch. The pop of color is such a nice touch. So sweet! I love the sponged stars popping ou! Such a sweet baby card! I love how you swiped the Hello Honey on the dsp. These colors are all fabulous together. Linda, This is super-cute! Love your take on the sketch and love how the stars pop. Thanks for playing along with this week's PPA sketch. Sweet use of the Irresistibly Yours DSP..Thanks for sharing and your inspiration! What a sweet card.love the greeting in two parts . OH. MY. GOSH....I am in love with this card! The soft colors you used and the sponging....just absolutely adorable! And yes, I understood your statement perfectly! Thanks so much for participating in my Paper Players challenge this week! This is adorable! Soooo sweet. Yes, I am in the same boat as you so I completely understand. Awwwwwwwww, Linda! This is truly sweet ... and I know the new parents are going to treasure it! Believe it or not, I just received a text less than 3 minutes ago about a new baby coming for someone I adore in a few hours. Happy weekend. Absolutely gorgeous card! I love the colors and the details are amazing. This is so beautiful, Linda! Fabulous job combining the challenges. I especially love how you sponged the background for a very subtle look. So glad you could join us this week at The Paper Players! 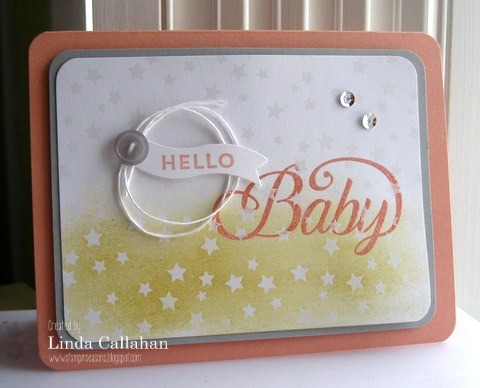 Perfect baby card, beautiful colors and the color at the bottom really leads the eye to the sentiment. Gorgeous! Such a pretty card Linda - love the way you interpreted the sketch. The subtle sponging and the loopy twine are perfect! Thanks for playing along with our CAS sentiment challenge over at The Paper Players this week! Oh this is just gorgeous! I love the sweet colours you've used and your sponged starts are just fabulous! Cute card and I know what you mean re daughters, daughters kids:) Let us know how you make out with the storm. Oh Linda, so soft and sweet the colors meet with baby swirls of stars and ink. You inspire so many at Pals Paper Arts Sketch challenge. Thank you for playing along.